Bottle. Clear amber in colour. Thick frothy head. Crème Brule, plums and raisins in flavour. The sweetness disperses to a tea like bitter finish. Just right for an English Strong Ale. Pours brown with a medium head that stays with the drink. Nose is toffee, malt, and some cardboard. Taste is certainly malt forward, a tad sweet, with some date syrup notes. Medium soft mouthfeel. Overall, a pretty good bre, but not great. Not sure I would bother with it again. Dark brown with a ruby tinge, still, no carbonation and 2 fingers of beige, creamy sea foam head. Solid skin lacing on the glass. Caramel, toffee, light fruity character, sweet like salt water taffy. Caramel, orange candy, iron, hard water, big dull bitter finish. Red tea. Weighty body, almost no carbonation, tannic finish. Beautifully done brew. Got in Bangkok, drank in Chiang Mai August 6, 2015. The flavours and the name match it well. 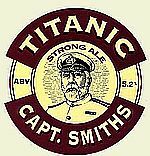 I think of the Titanic in its heaviness, made of iron but floating on the sea water, yet refined and with a stout heart as I imagine the captain had. Poured into an imperial nonic a deep rich bronze color with a thinner but well sustained white head,great rich color and clarity.Deeply fruity aromas with caramel cake and a tinge of hard water that lkingers,this is very English.Fruity and somewhat sweet up front with a decent drying leafy hoppiness in the finish,again a slight tinge of hard water.This is a great English ESB,Titanic really hit this one on the mark. Puffy pink-tinged taupe head that webs over pale clear russet body. Butter and toffee – straight Maris Otter – on the nose, no real hops. More butter, caramel snaps, Digestive biscuits and some black cherry, then substantial cedary bitterness. Golden raisin finish and lingering astringency. Medium, chewy, some stick. Boom! A real bitter, plenty of IBUs. The Maris Otter is just this side of too much, and it could use more aroma hops, but assertive and hefty. I do wonder if it’s over dry-hopped (that too-grassy bite) and it does have two extremes of butterscotch and aspirin rather than true balance. BB 28/02/2013, served cool in a straight imperial pint glass. A: pours a reddish chestnut brown colour with decent, fine carbonation, topped with a beige frothy head to last. S: immensely fruity – the nose is citrusy, red-grapey and nectarine-ish, from a distance smelling not unlike Fuller’s ESB actually. A closer sniff brings out the deeper elements from toasted malts along with a fine sweetness . T: roast nuts (I mean, malts) apparently leave a very deep footprint in this brew, as the initial swallow shows; such intensely dry palate as a result of both hops and roast malts backs the burned-nutty flavour, while fruitiness blends in harmoniously in the aftertaste. But the main, defining, character is the uncompromising level of chewy bitterness that elevates each sip to the next level, as my palate constantly yearns for more. M&D: medium-plus bodied, well-composed and well-balanced, this Premium Bitter is definitely a winner for anyone who enjoys a moderately hoppy ale that comes with a real vivid bitter kick. Wonderful! Brown 500ml bottle, best before 8th Apr 2009, drank 2nd Feb 2009. Poured into a straight UK pint glass. Dark, deep amber, a browny red colour. On top sat a good firm light tan coloured, foaming head. The head fell away to a thin covering and some lacing around the glass. The aroma was all about hops and toasted malts, also in the smell I picked up some woody and nutty hints. Hops and the aforementioned toasted malt dominated the flavours in the taste, with the hops taking centre stage. The hops also take over the aftertaste, which makes the beer fairly bitter tasting towards the end of the mouthfeel. One of the hoppiest UK beers I've ever had.